An economical and visually effective solution for use in a wide range of cinemas and auditoriums, we supply white and matte cinema screens which offer exceptional performance in dark conditions. The screens provide a seamless image, with high contrast and bright colours, as well as extra-wide viewing angles. At Specialty Cinema, we can provide white and matte screens according to your precise specifications. Because our services include not just sourcing and supplying your screen, but delivery, installation and after-sales care (including cleaning) as well, we literally offer a one-stop shop for your cinema screen requirements. 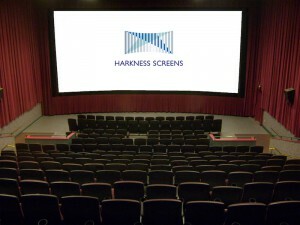 Specialty Cinema carries matte white cinema screens manufactured by Harkness Screens, Strong MDI, and Spectro Screens. Contact us today to see how Specialty Cinema can help you with your cinema screen requirements.